Picture it: You pored over your resume, reread your cover letter 10 times before pressing “Send” and nailed your initial phone screen with a recruiter. The interview is the only thing standing between you and the job you’ve worked so hard to get. Don’t let something as simple as your outfit hurt your chances. “It’s always really important to be professional, and come across as professional, even if you’re interviewing for a casual startup,” says Anne Lewis, director of sales for Betts Recruiting, headquartered in San Francisco. No matter what job you interview for, bring a pad, pen and extra copies of your resume, ideally in a polished-looking portfolio or folder. The standards for interview dress vary from industry to industry. 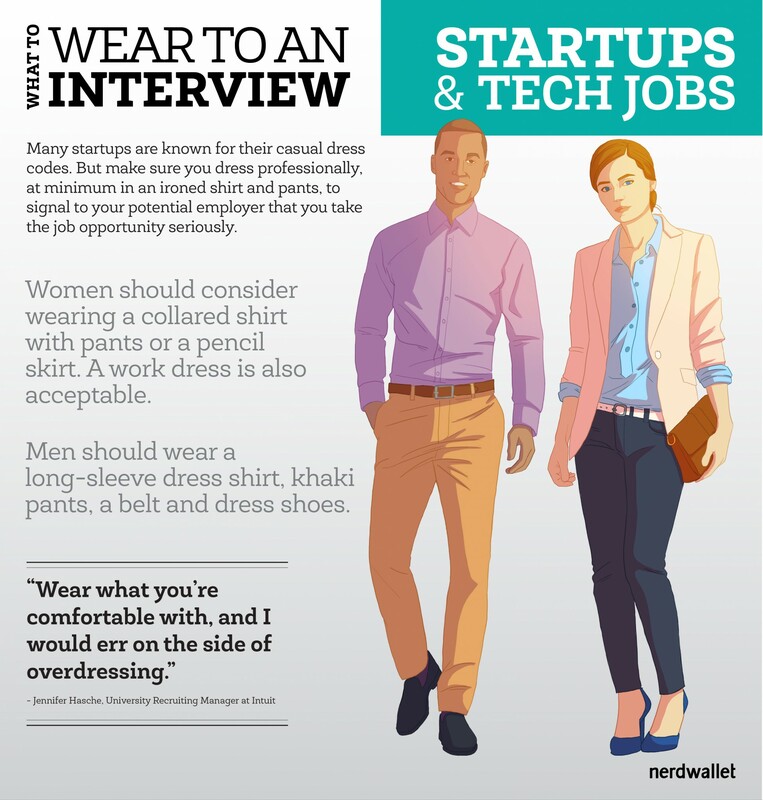 While many startups are known for their relaxed dress codes, make sure you dress professionally, at minimum in an ironed shirt and pants, to signal to your potential employer that you take the job opportunity seriously. “Wear what you’re comfortable with, and I would err on the side of overdressing,” says Jennifer Hasche, university recruiting manager for Intuit. Men should wear a long-sleeve dress shirt, khaki pants, a belt and dress shoes. You can’t go wrong with a suit, Lewis says, but it may not be necessary if the company specifically notes its dress code is laid-back. Women should consider wearing a collared shirt with pants or a pencil skirt. A work dress is also acceptable. If women opt for heels, they should bring a pair of flats along, Hasche says. Some tech campuses are large, and the interview might require you to walk across grass or to meet different people across multiple buildings, she says. More importantly, show your interviewers respect by turning your phone off, or leaving it at home — even though it’s gotten more acceptable to keep it visible in social situations, especially at a startup. “In the interview stage, it’s still a no-no to have your phone in there,” Hasche says. Your employer will be grateful that you’re committed to the opportunity, not to what might be happening on Twitter.